We have stopped issuing daily avalanche advisories for the 2017-2018 season. A big thanks to all who supported the avalanche center this season. Avalanche activity will invariably occur this spring. Continued daily wet snow melt-freeze cycles will occur and additional storm cycles may impact the forecast area. Some information and resources to aid in trip planning and decision making have been assembled on the advisory page. Loose wet avalanche activity will continue to occur this spring on all aspects at all elevations. The amount of instability will vary from day to day. Recent new snow under rapid warming will almost always be problematic. Under established melt-freeze conditions of a week or more, the amount of day to day variance of loose wet instability will depend on the degree of overnight snow surface refreeze and the rate of daytime warming. Cloud cover overnight can greatly inhibit snow surface refreeze. Follow the NWS-Reno Backcountry Weather Forecast to identify periods of expected cloud cover and for air temperature forecasts. GEOS West satellite imagery is useful for seeing how much cloud cover occurred overnight. Check the weather station table for a list of early morning air temperatures at various locations around the forecast area. If cloud cover was present and air temperatures were above freezing, overnight refreeze will be poor to nonexistent. If this is the case, travel in avalanche terrain is not recommended. Choose a different day. If skies were clear the amount of refreeze will be related to air temperature. Near or slightly above freezing air temperatures under clear skies will allow for the top few inches of the snowpack to refreeze on open slopes. This superficial refreeze usually allows for a short period of good travel conditions during the early morning hours. When this is the case, the snow surface is often not refrozen in areas under forest canopy. A comparison of surface crust thickness on open slopes vs under thick forest canopy will give a good indication of overall strength of snow surface refreeze in the area. The further and longer air temperatures drop below freezing overnight, the better the snow surface refreeze will be both on open slopes and under forest canopy. Once melt makes the surface crust marginally supportable to unsupportable, loose wet avalanches are possible. Human triggered roller balls are also a sign of potentially unstable snow. Avoid travel in or below avalanche terrain on slopes with marginally supportable to unsupportable wet snow conditions or on slopes where roller balls are occurring. Natural and human triggered wind slab avalanches may occur during and immediately after any late season storms. Expect a period of snowpack instability during the storm itself, then a second cycle of avalanche activity as rapid warming occurs post storm. During the storm, use clues such as blowing snow, cornice formation, and wind pillow formation to identify where potentially unstable wind slabs exist. Look for typical signs of mid winter instability such as recent avalanche activity, wind loading, collapse, audible whumpfing sounds, and/or shooting cracks. Identify and avoid avalanche terrain in areas where recently formed wind slabs exist. Post storm, new snow will be very sensitive to rapid warming and incoming solar radiation. Newly formed wind slabs could be easy to trigger post storm during rapid warming. During periods of rapid warming after new late season snowfall, storm slabs and wind slabs can transition to wet slabs. The high sun angle in late April and May allows for significantly more incoming solar radiation to affect the snowpack on NW-N-NE-E-SE aspects than what occurs during December, January, February, and March. If an active weak layer exists at the bottom of a recently formed storm slab or wind slab, rapid warming of the snow surface can increase the deformation rate of the slab adding additional stress to the weak layer below. This can cause an increase in snowpack instability. This is when natural avalanches can occur during periods of rapid warming post storm under sunny skies and light winds. Other hazards exist for over snow travelers in the backcountry. A few of these are cornice fall, moats, glide cracks, and open creeks. Stay well back from abrupt edges along ridgelines as natural and human triggered cornice collapse remains possible this spring. Stay out from under cornice areas that are not well frozen, especially if you can see or hear water dripping from the cornice. Areas of weak snow around rocks, vegetation, and along the base of cliff bands exist. Move carefully around these features as the thin bridges of snow could collapse under body weight, allowing you to fall into a melted hole next to the feature. Exercise caution when traveling near or attempting to cross creeks as wet snow along the banks can collapse under the weight of a person. Most creeks below 8,000' are open. Creeks are running high this spring and present a route finding difficulty in many areas. The observations page will remain available for sharing snowpack and avalanche observations submitted to the avalanche center. 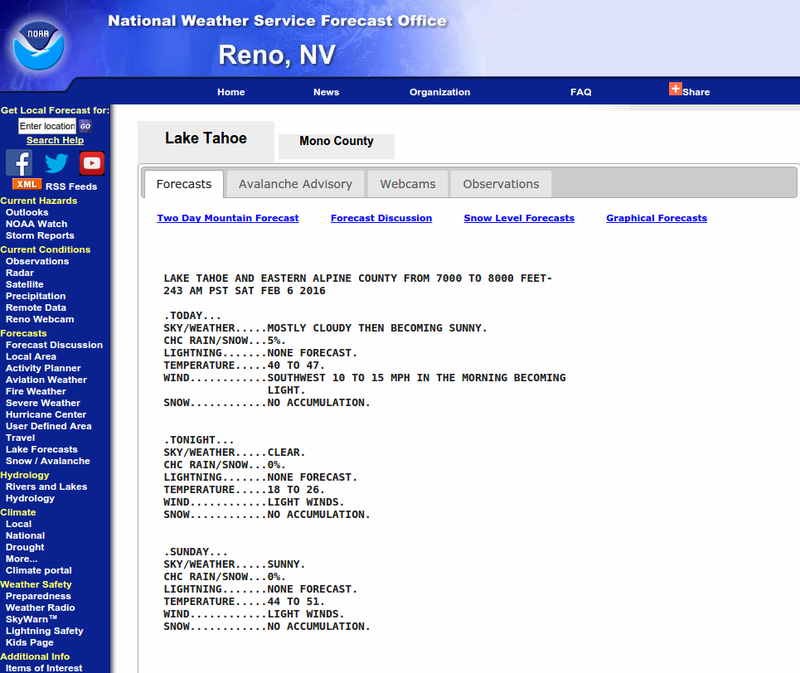 Check the NWS Reno Backcountry Weather Forecast. It also includes tabs to remote weather station data. Click on the Weather Station map and table buttons below for info from additional specific weather stations. 0600 temperature: (Check the data on the SAC Weather Station Map link at left.) deg. F.